The Patek Philippe Golden Ellipse collection stands quite parallel to the traditional looking Calatrava series. Inclining more on the artistic side, the Golden Ellipse collection was introduced in 1968 bringing forth the uniformity of class with simplicity. 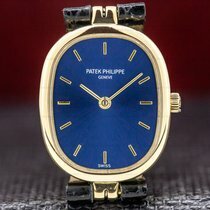 Being one of the most recognized watches in the Patek Philippe line, the watch has gained immense success under the company’s flagship. Based on the “Golden Ratio”, the elliptical design was designed on the lines of this ratio. Giving a visual aesthetic appeal to the eyes, the design is a merge of classic blending with the contemporary look. The Patek Philippe Golden Ellipse has come up with a line of high end luxury watches emphasizing a natural look to the timepieces. The classic elliptic shape is enhanced employed vibrant colors in the dial. In an attempt to make it look natural, the Patek Philippe Golden Ellipse doesn’t use the numerals or seconds hand in the timepiece. With two versions of the collection available, the smaller variation is designed for the ladies selection. Breaking the lines from the Calatrava collection, the Golden Ellipse timepieces brings forth the unique and artistic side of the Patek Philippe lineage. Incorporating natural patterns in the watchmaking, the Golden Ellipse unleashes the unconventional appeal of the timeline with incorporating unusual designs in the timepieces. 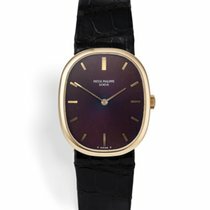 Celebrating its 40 the anniversary in 2008, the fashion line introduced the first platinum watch in the collection. Epitomizing simplicity in style, the elegance in the Golden Ellipse collection has been sustained with the use of minimal technology and employing man made features in the watchmaking. The main highlighting feature of these timepieces is the plain dials without assimilating second hands or numerals to mark the time. The dials are embellished with lines which act as the indices as well as the time markers. Enhancing the visual aesthetic appeal of the wristlet, the dial has been embellished with blue colors adding depths to its design. The patterns of the Golden Ellipse are shaped with elliptic forms but it looks like a rectangle with marked outward angles giving it a different look. The slim and sleek patterns beautify the wristlets elevating the air of elegance in the Golden Ellipse collection. Maintaining a symmetrical form with the geometrical shapes of the dial, the colors adoring the dial are available in three versions: deep blue, brown or brown grey with a sunburst texture.